As Comic Club wound down this year we decided to have a rockin party to celebrate all our big work. Our 1st plan was to sketch out amazing, comic inspired dishes, treats which might make us invisible, ward off a zombie attack, edible bits of a molten island of volcanic worms. Needless to say, this was an inspired and totally fun sketching session and we came up with some wild ideas. As predicted some of our plans just couldn't be made using modern technology- "a pancake which covers the moon" being a prime example. If we only had a ray gun and a magnifying glass! Maybe next year. The kids and moms totally stepped up to the plate though and on feast day we had such a comic spread, Hulk would have to loosen his belt a couple notches. The party was such a huge hit, we're doing it again next year and I think we'll have to invite some of Portland's grown up comic makers, since it would be a shame for them to miss out on all our feasty fun. Using the headphone attachments, Xander explains the origins of the Shrink-O-Zapper, a cosmic machine from Pluto, it needed an indigenous group of Plutonians to operate it. Since Pluto is no longer classified as a planet such individuals could not be located. 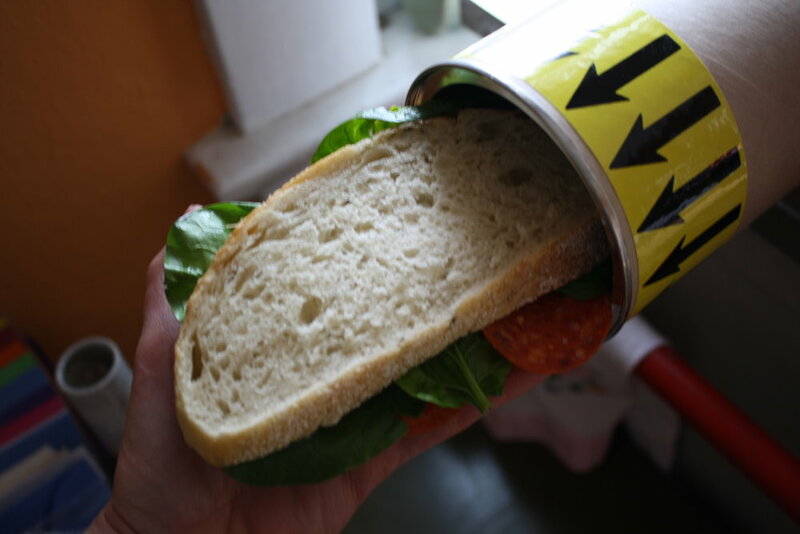 To give it SUPER Hero properties, a normal sandwich is dipped in radioactive waste and inserted into the machine. Now this is where the crazy steps in... We thought the sandwich would shrink down, we did the math and consulted the oracle, perhaps hubris is to blame. Rather than playing it safe, the kids turned the knob up to 11, well past safety parameters outlined in the Mad Scientist Handbook, what emerged was a cloned freak of nature... DOZENS of tiny sandwiches! 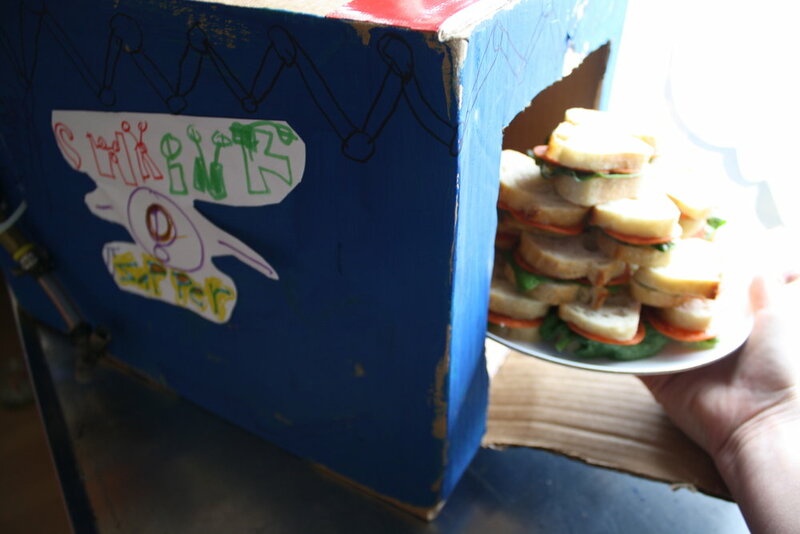 We devoured these with gusto, suddenly aware that we could lift teeny tiny buildings using nothing but a pinkie. 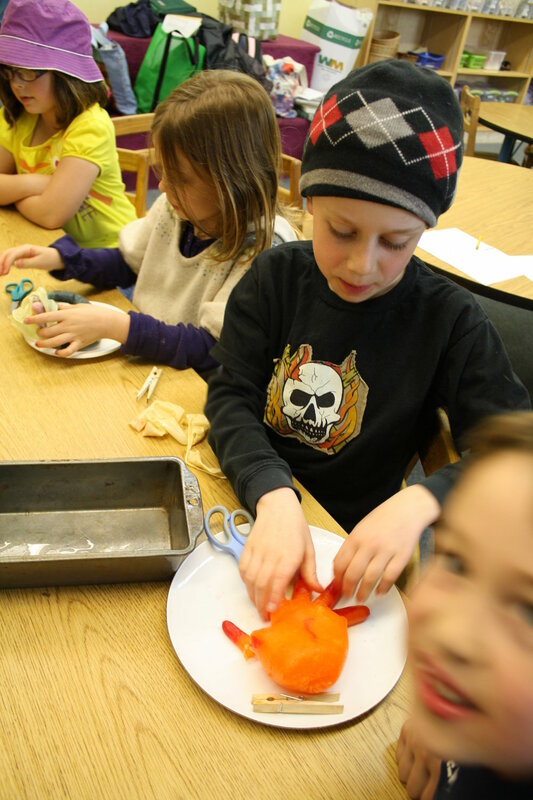 Henry's project was just as diabolical, an oozing lava volcano surrounded by a deadly moat with flesh eating zombie worms. Completely unafraid of any approaching zombie army, his mom, Elizabeth created a jello AND chocolate pudding monstrosity which spit fire and rested on an Oreo cookie island of destruction. Jello was a reoccurring theme in the Comic Feast, turning up in a number of dishes. I think there is a number of reasons for this, the ability to choose colors, it's sugary goodness and it's intrinsic personality of an evil villain like The Blob. 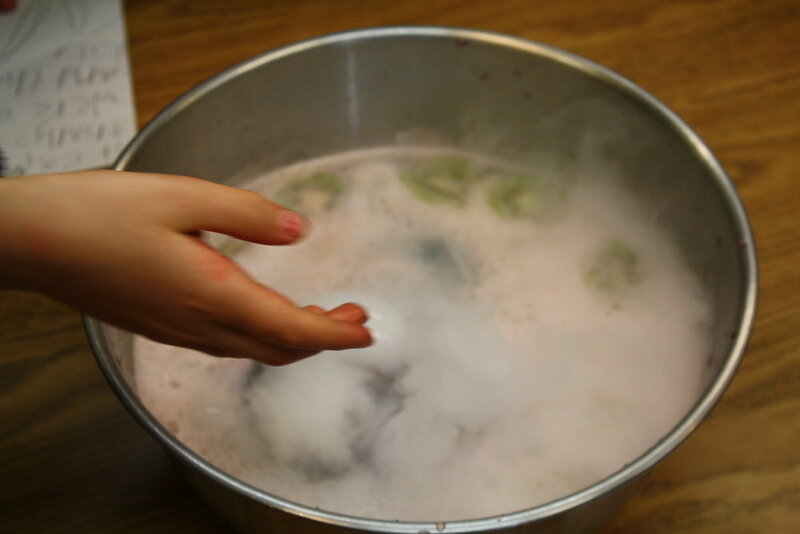 Several flavors of berry jello were used to make the super creepy, rigor-eded" Frozen Dead Man's Hand" which had to be extracted from latex gloves with scissors. To wash everything down we had Monster Punch. While the base liquid for this is alien blood, I think Kool-Aid can be used as a substitute, you'll need to hunt down some monster eyeballs too which look amazingly similar to kiwi fruit. We don't know what caused the punch to smoke like that, it was probably pure evil, which we thought might leave a bitter after taste, but was actually delicious. Older PostComic Makers show us how it's done!